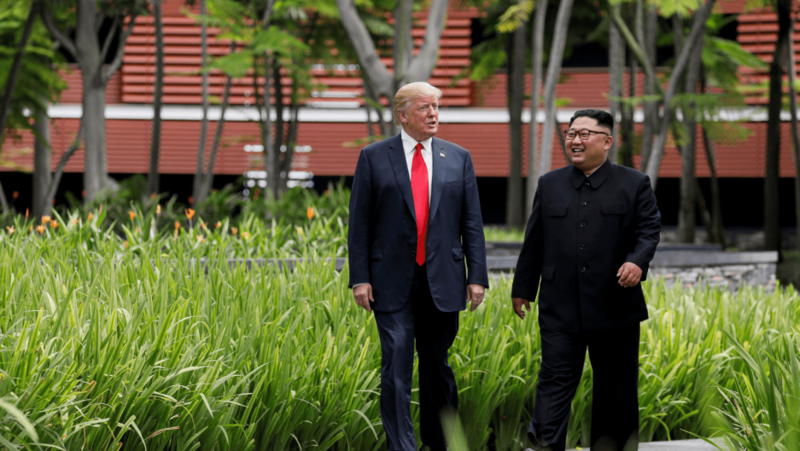 Three months ago, President Donald Trump and North Korean leader Kim Jong-un were shaking hands, sharing short ribs and signing a vague — but exciting — roadmap for “peace and prosperity.” Now, things appear to be on the verge of falling apart. On Aug. 24, the White House abruptly canceled Secretary of State Mike Pompeo’s upcoming Pyongyang visit. Then, just days later, the US blocked a field study that would allow South Korean President Moon Jae-in to begin planning the $36 billion railway system he promised North Korea — a strategic incentive to keep Kim in good spirits. Much of Moon’s plans to improve relations and the South Korean economy — including a re-opening of the Kaesong Industrial Complex and the inter-Korean train system — would violate the UN sanctions that the US is trying to enforce against North Korea. It’s a major blow to Moon’s hopes for a new era. But he’s still shooting for progress — Moon plans to meet Kim in Pyongyang sometime this month, and a special envoy is expected to firm the details tomorrow. But even so, one has to wonder how far things can truly progress without Trump’s support — and even worse, whether renewed relations will sour. North Korea and the United States are in the throes of a disagreement they’ve always had: What comes first — denuclearization or an end to the Korean War? In short, it’s a trust issue: North Korea has been accused of continuing its nuclear program, and the White House is committed to choking the country with economic sanctions until it’s completely shuttered. But from North Korea’s perspective, the United States has done very little to show its good faith: Since his meeting with Trump, Kim Jong-un has returned the remains of US soldiers, dismantled missile-testing facilities and reeled in some of the anti-American rhetoric. Meanwhile, the US hasn’t done much other than halt its joint military exercises with South Korea. Technically, North Korea promised to “work toward complete denuclearization” at its summits with Trump and Moon — not give up their nuclear weapons outright. Other experts believe that North Korea will likely never give up its nuclear weapons — though that doesn’t mean they’ll always threaten to use them. Relations between the US and North Korea may be tense, but it’s really Moon who could lose the most. Much of the South Korean president’s first term banked on improved relations with the North, at first yielding him a sky-high, 88-percent approval rating. But these days, the excitement of the summits have largely died down on the streets of Seoul. South Koreans are going on with their lives, largely returning their attention to the tough economy. Moon’s approval ratings have slid to roughly 55 percent. Moon may be stuck in political gridlock if the US or North Korea doesn’t change its stance soon. North Korea likely wants to broker a deal that lifts sanctions “so the South Koreans and Chinese can invest in them,” Ward said. But again, the problem lies partly in the United States’ desire to achieve denuclearization first. Nevertheless, it’s too soon to say all hopes are gone. Experts hope that the next inter-Korean summit will bring on a wave of good spirits, and hopefully pave the way for another meeting between Trump and Kim. Originally published by Public Radio International under a Creative Commons license.